Travel time between the Jardim Oceânico station in Barra da Tijuca and Centro in Rio will be shortened to 30 minutes. 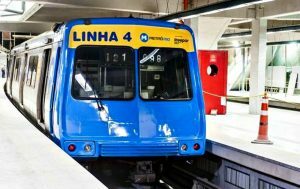 RIO DE JANEIRO, BRAZIL – This Saturday (March 25th) MetrôRio will inaugurate the direct connection between lines 1 and 4 of the subway system, ending with the need for the rider to transfer at General Osório station in Ipanema. The Jardim Oceânico Metro station in Barra da Tijuca, photo by Paulo Vitor/IMPRENSA RJ. 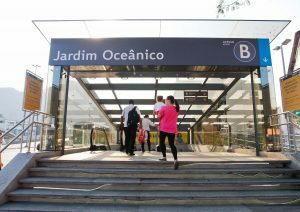 As a result, the travel time will be shortened between the Jardim Oceânico station in Barra da Tijuca and Centro in Rio, and a passenger will be able to make the trip in 30 minutes, according to MetrôRio. With the interconnection completed, during times of the heaviest passenger movement, the intervals will be reduced to 4 minutes and 30 seconds, which is two minutes less than it has been. The long-awaited Metro Line 4 opened to the public after the Paralympics ended on September 18th, photo courtesy of Prefeitura do Rio de Janeiro. Line 4 opened to the entire public on September 19th, the day after the Paralympic Games closed, and began with Monday to Friday from 6AM to 9PM. The second stage of planning began on November 5th, with the opening of the system on Saturdays, with opening and closing times being maintained. From December 17, 2016, the new line began extending hours to operate on the same days and times of Lines 1 and 2: Monday to Saturday, from 5AM to midnight, and Sundays and holidays, from 7AM to 11PM, at General Station Osorio the transfer point. Line 4 transports, on average, 110,000 passengers per day and connects with the BRT (rapid bus transit system) at Estação Jardim Oceanico, which continues stretching west in Barra and beyond. Considered the eighth most congested city in the world, Rio de Janeiro is preparing to have, for the first time, a subway system that connects the city from end to end. It used to take a resident of Zona Oeste (West Zone) about 120 minutes to reach the Centro by using buses, and now that time has been reduced by 75 percent. The new Line’s original plans called for an extension that would also reach Gávea, but as early as 2014, officials stated that the Gávea extension would not be ready in 2016, and perhaps not even 2017. Before coming to a halt in early 2016, about forty percent of the excavation for the extension between Leblon and Gávea had been completed with an additional 1.2 kilometers left to go.